Craig’s ambitious. He wants promotion, recognition and to be one of the lads. Relationships and family don’t feature in the plan; until he’s given no alternative. Susan’s taken a huge step. She’s walked away from the oppressive security of her marriage and moved to Birmingham for a fresh start – in the flat next door to Craig. They’re not friends. But maybe a neighbour can do more than keep an emergency spare key. Life isn’t a walk in the park. Perhaps taking one might help. 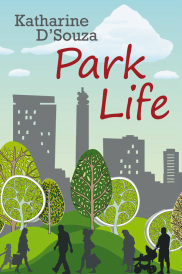 Park Life is available for Kindle here, Apple devices here, Kobo here or in paperback here. Fancy reading chapter one? Click here and you can! Susan's new in town and it all seems strange to her. See her first impressions here. Craig's in consultancy but thinks he'd make a great personal trainer. He's been working on a sample training plan. What do you think? If you've read and enjoyed the book, please do spread the word. Tell your friends, post a review on Amazon or Goodreads, blog or tweet about it and I'd love to hear what you think. Thank you.